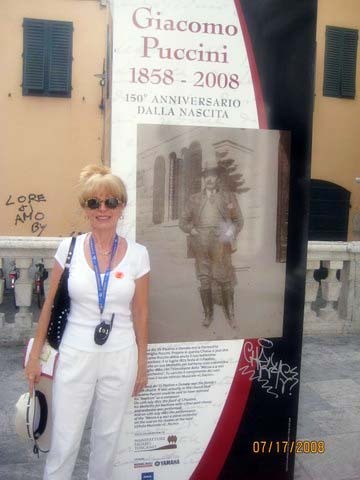 On a Holland America cruise of the Western Mediterranean this summer, Opera Society member and officer Linda Balent had the good fortune to visit the Tuscan city of Lucca (pronounced loo’-ka), the birthplace of Giacomo Puccini. The city is celebrating the 150th anniversary of his birth with many festive posters. From the café named Turandot to the statue of the Maestro himself gracing a square in front of his home, and to his boyhood church where he was the organist, Puccini seems to be as alive as ever here. We will be treated to an FGO production of his Madama Butterfly in May 2009. Also on the itinerary was the Opera House in Palmero, which claims to be the third largest house in Europe. With a wonderful statue of Verdi placed to the left of the entrance, it proclaims the Italians’ enduring love for him as a genius and as a symbol of Italian nationalism. FGO will open its 2008-09 season with Verdi’s La traviata.